Heinz, Hunt's, Store Brand, I have tried quite a spectrum of ketchup brands so far. I have been on a Ketchup Quest of sorts. D made some pretty good ketchup last summer, using the tomatoes from our garden, some plain white vinegar, sugar, salt and a bouquet garni with his secret spices. He didn't can it and he made just small batches and we used them up. It was better than any of the store-bought corn syrup concoctions. But, I wanted a consistent, readily-available, affordable good ketchup. I think I have found one: the other day, I wanted some ketchup with the scrambled eggs and just then remembered that we were completely out and started my tirade about how bad ketchup tastes most of the time and how just about all brands taste equally awful and that ketchup texture is slimy most of the time etc. when D quietly served up some ketchup for me magically out of a standard-looking ketchup bottle. I didn't think twice about it and started eating, expecting to be disappointed anyway. Boy! What a difference! I liked the texture very much and the taste was pretty darn good - way better than other ketchup I had had till then - crisply fresh, not slimy, not too sweet, can taste the vinegar and spices more than the sweetness, plus it was a nice bright red, not a dull red. So, I was naturally curious. 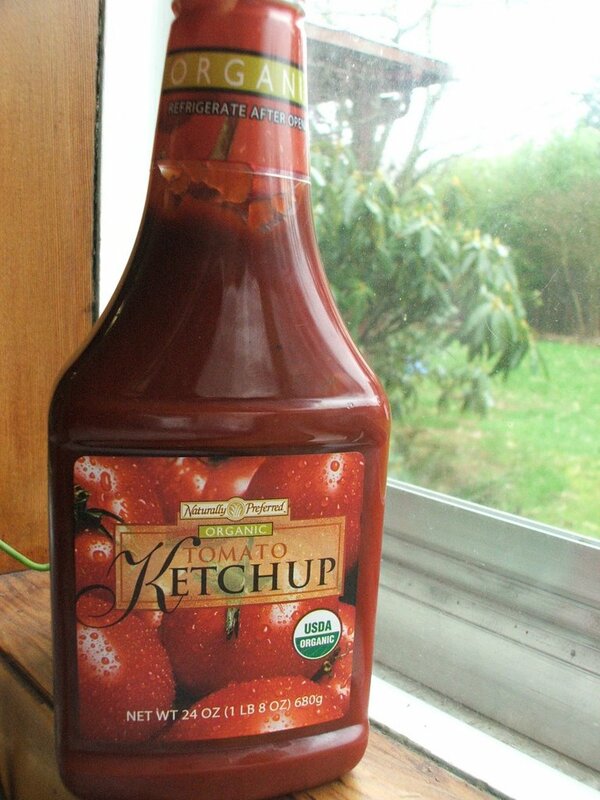 D had bought this ketchup pictured above, just out of sheer disappointment with other popular brands we had tried. We hadn't tried this brand before and so he figured it was as good as any other and bought it. I think I have found at least one brand that more than meets my ketchup expectations. The ingredients list attests my view: organic tomato puree, organic sugar, organic white vinegar, salt, organic onion powder, organic spices. Now, some of my friends go crazy and look for exclusively organic products. I am not quite there, and don't see myself getting there in a hurry. And, just the fact that every ingredient is organic doesn't automatically make it superior-tasting in my book. But, this ketchup quest has reinforced my personal tastes: corn syrup, especially the hfcs, in foods is out for me. (Some studies show a direct relationship between increase in obesity and consumption of high fructose corn syrup).